This February 13th, Space NK will host the “Spring Beauty Edit” event across our 28 US locations (freestanding boutiques as well as Space NK inside select Bloomingdale’s). During this special shopping event, customers will be perfectly prepped for the new season as we present the latest in spring trends and looks from our SS18 campaign. Guests can meet with experts from some of our finest brands for makeovers, advice and tips. Event times, featured experts and services vary by location. 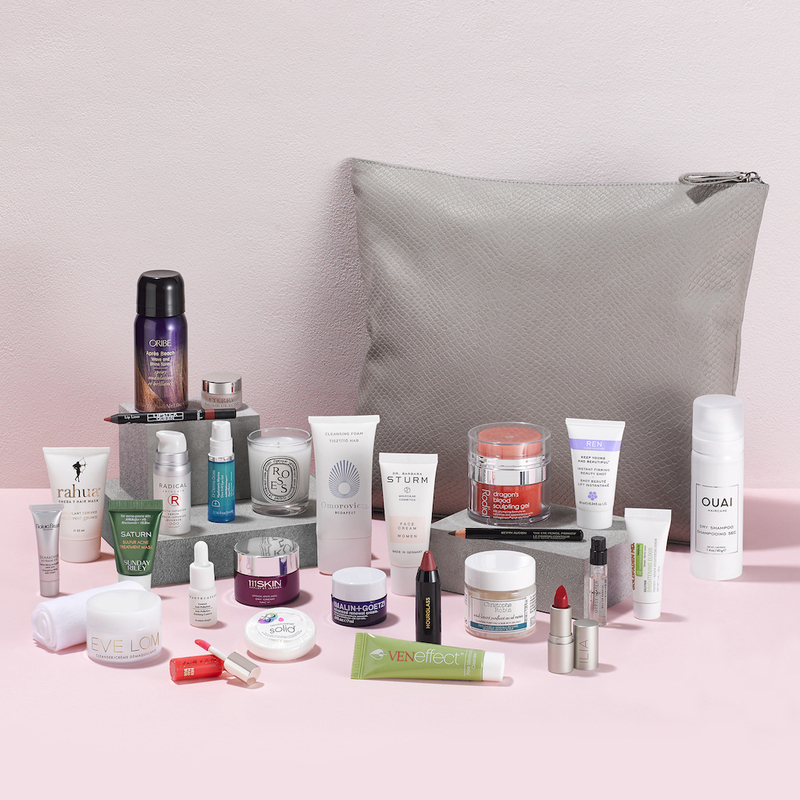 Exclusively for the event, and while supplies last, shoppers who spend $275 or more will receive a gift with a selection of must-haves in travel-friendly size from 27 of our featured brands. Our loyal N.Dulge members (SIGN UP HERE) will have early access to the gift on Monday, February 12th before the offer opens up to the public on Tuesday, February 13th. This gift with purchase will sell out in stores early, but will also be available to online shoppers at spacenk.com on February 13th (US only). We hope that you might find a new favorite for the season and consider offering a sneak peek to your followers (@spacenkusa / #SNKbeautyedit). Since the official event begins tomorrow, February 13, I will post all of my pictures of the gift first thing in the morning. Hi Helen: I'm an NDulge member since 2014 and I've made multiple purchases over the years. And I really feel that people need to know that SpaceNk's on-line customer service has been seriously downgraded. So if there is any problem with an on-line purchase, you will find that they never return phone calls; their email response is slow and incompetent; and there is never any way to reach a real person. They withheld a promised refund for over a month, until I had to go to Paypal resolution. It appears that they are totally automated and unresponsive. Writing to them does not help. It's a big disappointment. And I know from both the store and Paypal that many have experienced the problem with their new CS. I hope you will publish this and allow your readers to be warned. I am a long time customer and very sad that I won't be able to shop on-line there any more. I am so sorry to hear about your last experience with your online Space NK purchase. In all of the years that I have shopped with Space NK, online and in store, I have never experienced anything like this, nor have I had any of my readers complain to me of this type of experience. I hope that this is just an isolated experience. As soon as I read your comment I immediately reached out to one of my contacts at Space NK, and they are extremely concerned about your experience and asked me to see whether you would be willing to send me your email or phone number so that they can contact you directly. I was assured that the online sales and customer service department is not automated, and that my contact works directly with the customer service manager. I would really love to help you get in touch with the people who work at Space NK so that they can address your concerns. I really is, Allison! They always do such an amazing job with their gift bag, and the vent itself! It is definitely one of my very favorite events of the year! Yes, I think that you would really love the lipsticks! Be sure to check back tomorrow, I am posting pictures of the actual gift at 12:30AM PST since it starts tomorrow for the general public. It was such a nice surprise to see the N.Dulge early access email for this in my inbox this morning! Now that Space NK carries Emma Hardie, I can try the famous cleansing balm at last. It always is such a great treat when that email arrives! I am so glad that you can now indulge in Emma Hardie there! Be sure to check LSBB tomorrow morning because I am posting all of the pictures of the actual bag at 12:30AM PST. It really is a great bag! I can't wait to hear what you think about the Emma Hardie cleansing balm! I can't wait for the international version to come out! Space NK has the best GWPs for sure! Yes, that is a great version! I can't wait for you to get your hands on it! Their GWPs really are amazing! It's really amazing, that is for sure! What a great promotion. So many wonderful items that I know I'd fall for. It really is, amazing– as always! You would love this bag, Marcia! Space NK is one of my fav places to shop, and this looks stunning. You and me both, Norah! This is definitely a great gift bag! AGREED! Space NK definitely knows how to put on an amazing event, and makes the most amazing gift bags! Wow that's an amazing GWP! The Diptyque candle is a nice touch, and there are so many brands I've been dying to try in there. Isn't it amazing?! They really set the bar so high for every company who does beauty gifts with purchase. This is definitely an event worth shopping, and their gift bags are such a great way to try so many luxe brands. I adore SpaceNK GWPs, and this one is absolutely magical! I will have to check and see if I need to replenish any of my products. Me too, they are so amazing! I agree with you that this one is truly magical! It's definitely worth checking to see if you need to replenish any of your favorite products. I haven't shopped at Space NK before but I kind of want to change that now just for that bag! Space NK is an incredible wonderland for the skincare and makeup obsessed! Thank you Allison for mentioning the sub par and even non existent customer service at Soace NK lately. I’ve been a long time Space NK customer and spend a lot of money there each year. I’ve also been unable to reach anyone by phone for a refund that I’ve been waiting for since early January. Emails are also not returned. You are either given a boilerplate response that someone will get in touch with you (which never happens) or you leave a message with the promise someone will return your call and that also never happens. I’ve finally had to resort to filing a dispute claim with my credit card company in order to seek restitution. I would love to purchase this gift but I would be a fool to give them more money when they haven’t made good on what they owe me already. Sad as I’ve always loved SpaceNK! I am so sorry to hear that you also had problems with customer service. I contacted Space NK to let them know about your experience. If you send me your email address and/or phone number– I will send it to my contact at Space NK who will give it to the customer service manager directly. I would be more than happy to help you get in touch with the right people. It really is an amazing gift! Their gifts with purchase are always VERY impressive! Like always, this GWP is one of the most impressive ones I've seen! Such a great assortment of top notch brands. Agreed, it truly is! They always do such an impressive job with their gifts with purchase! Nikki, I actually had the same experience recently ( an unanswered email and unreturned phone call). It was the first time I've experienced that with their customer service. I did manage to get somone on the phone who promptly resolved my issue. I still did the promotion but wanted to lend another voice to say that their has been a slide in the quality of customer service. Hope they can resolve it, as it's still a great company. Thank you so much for offering to help. I’m sure my problem will be resolved in my favor through the credit card dispute process. It’s just been disappointing, mainly because I’ve been a long time customer and have never had even the slightest issue with their products or service level ever. I hope that they get back on track. I wanted to report back to both of you with many thanks for Helen's kind intervention. First to say that I did get my refund; and the customer service very kindly sent me a complementary gift as an apology for this problem. That was truly lovely for them to do that. At the same time, the email response I received from Customer Service as a result of this being drawn to their attention sounded yet again as though it had been written by someone who was a bit unskilled in communicating with the public. I feel sorry for her as she is clearly trying but perhaps more training is needed. Among a few other things, she wrote that, "We have been experiencing a much higher volume of requests than anticipated, but hope this did not cause any inconvenience to you!" Well, it was inconvenient to have to initiate a Paypal dispute to get a promised refund, so that was a slightly absurd thing to say. I am very grateful for your intervention, Helen, and their generosity, which was quite unexpected. At the same time, I feel that I have yet to speak to an actual human being who would offer a way to reach a more mature level of management should anything like this occur in future. In addition, their automated letter feedback system asks for feedback but no one responds to the actual feedback. So I keep getting the sense that I am talking to a robot. I truly wonder if their system is now AI, and if that is so, it's a little scary. I still love the products and will shop in my local store. But I am gun shy about buying on line because the human touch seems lacking.